Fast Response! We’ll Clear The Toughest Clogs! Get A FREE ESTIMATE TODAY. Santa Clarita is a beautiful city in sunny California. There are many beautiful trees and landscaping. However, the plumbing system in Santa Clarita is aging and with old clay sewer pipes. It comes with no surprise that root damaged sewers are the #1 cause for clogged drains in the Santa Clarita area. If you have a clogged drain, and your clogged drains are interfering with your daily routine; The Rooter Drain Expert is the solution. It does not matter what the mass blocking your drain is ( hair clogs, grease clogs, roots, dirt), we will clear even the toughest clogs! We have the best tools in the industry. If you are interested in our arsenal of tools and would like to learn more about them, we provide informational pages to our customers so they have an idea of what each one does. As stated tree roots are the #1 cause of your sewer line problems. But don’t worry at Rooter Drain Expert we have the solution to your clogged toilets nightmare. The best way to find out if you have roots problems is to have regular annually Santa Clarita camera inspection, once it is confirmed that roots have intruded your sewer line our plumbers will give you the solution that is best for your situation. We have the newest tools to make even something like a sewer line repair not so disruptive for your convenience. We suggest for you to read some pages that are dedicated to helping you understand the logistics of some of our services as well as your sewer line responsibility as a homeowner or property owner. We are the local Santa Clarita plumbers and we provide you with unmatched personalized customer service and prices with less overhead than the big corporations. We are a local family owned and operated business that has been serving the Santa Clarita valley for over 2 decades. When you call Rooter Drain Expert, you not only are helping your local economy but you also are getting more attention and better prices. As The Santa Clarita Plumbers, we are licensed bonded and insured for your safety! We recommend for you to hire only licensed plumbers “Why hire licensed plumbers?“, plumbing projects should be up to code and follow regulations so you don’t want just anybody doing plumbing for you. If your sewer line is clogged, you should treat it as an emergency situation and contact a plumber right away to have it repaired. Whether you need your sewer line replaced or simply unclogged, time is of the essence in responding to the problem. Here are the answers to some questions you might have about clogged sewer lines. What causes a clogged sewer line? 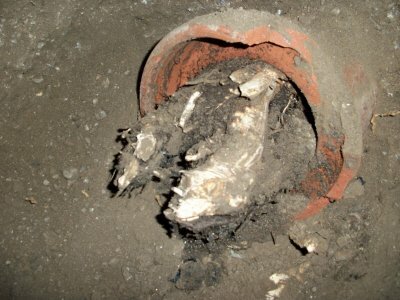 In many cases, the clog is caused by roots in the sewer line. An intruding root from a nearby tree can puncture holes in your line and even cause a blockage. Older sewer lines may simply deteriorate and break down over time. Much of the time, however, sewer line blocks result when you put items in your toilet or sink drain that they aren’t designed to handle, such as grease, paper towels, or baby wipes. How can I tell if I have a clogged sewer line? It is usually fairly easy to tell when you have a clog in your sewer line. If you’re noticing backups or overflowing in multiple drains—such as both your toilet and your kitchen sink—it’s a sure sign that you have a sewer line issue. Bubbling water in your toilet is another telltale symptom of a clogged sewer line. What should I do when I have a clog in my sewer line? You might be tempted to try to fix the clog yourself using a chemical cleaner. Harsh commercial cleaners, however, can do damage to your pipes and may not even resolve the issue. The safest and surest way to clear up a clog is to rely on an experienced professional. The plumbers at The Rooter Drain Expert can use state-of-the-art equipment—including video inspection, hydro jetting, and trenchless pipe repair—to solve the problem for you. When you’ve got a clogged drain or a broken sewer line, it’s time to get in touch with The Rooter Drain Expert. Our plumbers will come to your home in Santa Clarita, CA, and resolve the issue quickly and efficiently. We’ve provided trenchless drain repair services for more than a thousand homes over the last 20 years. You can get in touch with us today at (661) 641-4165. Santa Clarita, CA – Rooter Drain Expert, a top emergency plumber in Santa Clarita is leveraging their in-depth experience with drains to help solve drainage problems for residents of Santa Clarita, CA and the surrounding communities. Through their residential and commercial plumbing services, they have been able to help both homes and businesses in the area. A key service that Rooter Drain Expert offers is emergency plumbing. When pipes are cracked, worn-out or just broken, their emergency plumbing services help to deal with the issue promptly so that it does not cause further problems. Since their team is responsive and attentive, they are able to take care of all emergency plumbing needs of their clients. To deliver their emergency plumbing services, their company has a team of plumbing professionals on standby to offer all-inclusive plumbing services to clients. Since they know emergencies can happen to both homes and businesses any time, they provide 24/7 emergency services for all plumbing problems. They are skilled in fixing both residential and commercial emergency plumbing needs. With their emergency van, equipped with all the tools and equipment needed to get the job done, they offer fast, reliable, and efficient services. Rooter Drain Expert, the plumber in Santa Clarita makes sure that pipes and sewers flow freely without any hindrances. They examine and conduct a thorough diagnosis of pipes and find the spot that is causing the problem. Then they offer a well-thought-out plumbing solution that gets the problem solved and gives peace of mind to the property owner. Rooter Drain Expert is the emergency plumber in Santa Clarita, CA specializing in trenchless technology, solving pipe or sewer-related issues in the simplest way possible at a reasonable rate. Their services include drain cleaning, drain repairs, hydro jetting, sewer pipelining, trenchless pipe bursting, and general plumbing. For more information about Santa Clarita visit the City Of Santa Clarita web page! you can also learn more here Santa Clarita, CA.